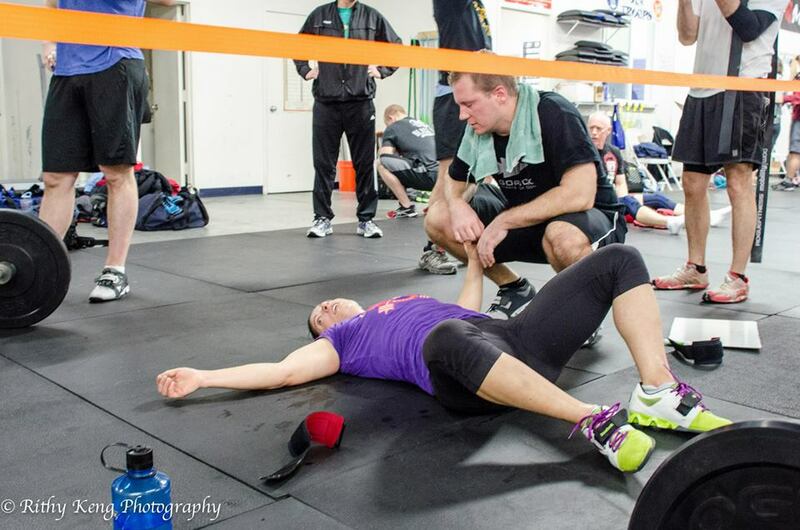 The last blog I posted was about how much I was dreading the 2014 CrossFit Open. Five weeks later, I must say that I am SO glad it’s over. I performed much better than I anticipated, but five straight weeks of irrational anxiety and obsessive checking of the leaderboard is emotionally draining, not to mention the physical toll that the workouts take on my body. How well I did depends on the denominator. Do I compare my final ranking to the total number of people that signed up, or only the people that completed the workouts? Clearly, I’d prefer the former but is that a true representation? It’s certainly accurate to say that of all the people that attempted the Open, I finished in the top 3% in the world and the top 4% in the Mid-Atlantic. But, all it takes to sign up is $20 and the internet. So the most accurate assessment is probably to look at how I finished each workout compared to the total number of people who completed that workout, and then take the average for all five workouts. If you do it that way, I finished in the top 6% (5.4% in the world, 6.2% in the region). This is a pretty good improvement from last year when I finished in the top 5% of the total roster, with my percentile rank averaging in the top 9% for all five workouts. But, this year my numeric ranking in the region went down by 19 spots, which means that even though I got better, some people either made better progress than I did from 2013 to 2014, or new people signed up who are better than me. That kind of stings, but I can’t really dwell on 19 people out of more than 6,000. So how were the workouts? My best workout was the last one, which was also the most brutal: a descending ladder of thrusters and burpees for time. This one frustrated me because I knew how fast I needed to complete the workout to finish the Open with the highest female ranking in my gym, yet I failed. However, this workout was so grueling that I decided not to re-do it. Honestly, I don’t think I could have improved my score. My shoulders are still killing me from Saturday – I tried to bench yesterday but couldn’t even do 3×5 at 115lbs, when I did the same rep scheme at 130lbs just last week. Today my left shoulder is killing me so badly that I think I may have actually done something to it. Unsurprisingly, my worst performance was the first workout, which was an AMRAP of double unders and snatches. I’m terrible at both movements, and I’ve struggled for YEARS to get my double unders. Therefore, I can’t be anything but pleased with the fact that I was still able to do fairly well on this one. At least, my double unders were not a completely limiting factor for me, which they would have been in previous years. I was most surprised by my performance on the second workout, which was an overhead squat and chest-to-bar pullup ladder in which you had to do a certain amount of work in three minutes, and if you completed it, you got another 3 minutes. Neither of these movements are very strong for me but I was able to get into the third set of three minutes, which I was really proud of. However, I had to do the workout twice to accomplish that feat. I missed it by one rep the first time I tried it. I’m glad that re-doing it ended up being worth it. I have nothing to say about the fourth workout. It sucked and was just a glaring reminder that I failed to reach the goal I set for myself last year of getting a muscle up by the 2014 Open. Oh well, maybe next year. Trying to regain consciousness after 14.5. Thanks to Rithy Keng for capturing this lovely moment.